Sometimes it’s difficult to pick just the right movie of the month for our program. We want to use movies that are going to give you some insight into the history and culture of the places we’re going to be visiting, but those don’t always seem to be the goals of the Hollywood movie studios who make these movies. Some movies are super realistic, but boring as can be – while other movies are fun and exciting to watch, but so full of factual errors that there’s no point to watching. In researching the many different Joan of Arc movies that have been made over the years, we found several that were exciting, action-packed modern movies that you guys would probably love… but… they were full of historical errors, political bias, and “just plain wrong”-ness that we couldn’t pick them. On the other hand, we found a French made movie, that critics claim is one of the best movies ever made and has one of the best female performances of all time in it, AND, at the same time, historians say that it’s incredibly accurate, because the script is taken directly from documents that have survived from Joan of Arc’s actual trial. So we watched it, and it was… well… pretty unwatchable for modern audiences, plus it only tells the story of her trial, not the battles and leadership that make her such an important historical figure (we did include this one below so you can be the judge). In the end, we chose a happy middle ground – a movie that tells the entire story of Joan of Arc – in a more modern way – and, while it takes a few Hollywood liberties with the story, it is far more accurate than the Joan of Arc movies made in recent years. 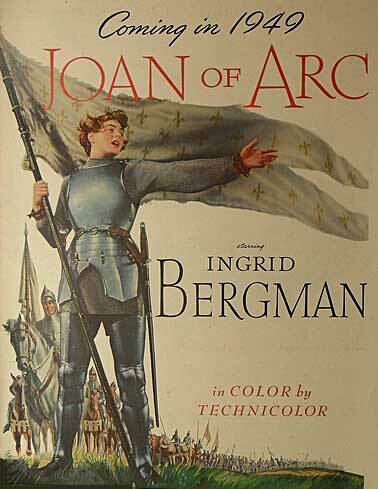 This movie, Joan of Arc, starring Ingrid Bergman (rated one of the top 4 female movie stars of all time, thanks to her roles in Hitchcock’s Notorius and the WWII drama Casablanca), and directed by one of the most respected filmmakers of all-time, Victor Fleming (director of The Wizard of Oz and Gone with the Wind). The movie is based on a successful Broadway play called Joan of Lorraine, which also starred Bergman, and was adapted for the screen by the original playwrite himself. Bergman had wanted to play Joan in a movie for many years, so this was considered a dream project for her. Both Bergman and her co-star, José Ferrer (making his film debut the Dauphin) earned Academy Award nominations for their parts. The film was acclaimed director Victor Fleming’s last project — he died two months after it was released. Even with much acclaim, and later the Academy Award nominations, the movie was not a big success at the box office. Bergman was a huge Hollywood name whose star had recently been tarnished by rumors of an extramarital affair, and audiences stayed away from the movie, because many people felt it was blasphemous to have an adulteress playing a saint on the big screen. One of the important things we have to do while watching Joan of Arc, is differentiate the fact from fiction, and before we head to France next June, have an understanding of what the real Joan’s story was like. This is important, because we will be visiting Rouen, the site of Joan’s trial and execution. Her story is important to understand the history of France, so please take the time to read this post carefully, to watch the videos we’ve found for you, and to understand (not just watch) the movie Joan of Arc. To give you a little context as to what the world was like during Joan of Arc’s short life, you need to have a basic understanding of The 100 Years War. The Hundred Years’ War was a series of conflicts fought by England and France between 1337 and 1453 to gain control of France. All told, five generations of monarchs from the two countries fought for over a century to control the throne of the largest kingdom in Western Europe. It really shouldn’t be called a Hundred Years’ War, though – that’s really a misleading name for it. Instead, it was a series of wars, with good-long chunks of peace in the middle (9 years of peace, 26 years of peace…) that all had the same goal – England wanted to control France, and France didn’t like that idea. It all begins with the Norman Conquest. As you know, Normandy is a region in Northern France – we’ll visit Normandy to see the D-Day beaches from WWII. Normandy was a region of France settled by descendants of the Vikings, and in 1066, in full-on Viking conquest mode, the Duke of Normandy – William, because of some disputes as to who was the rightful heir to the throne of England, decided to invade England and conquer. He did. Afterwards, he was known as William the Conqueror. After the Norman Conquest, the kings of England were vassals (which pretty much means they were assistant kings, running England, but answering to the Kings of France). Over time, the French royalty reduced the amount of land and property the English kings in France were able to control. This, of course, led to some animosity. Combine that with the fact that England kept going to war with Scotland (see Braveheart, a great movie that takes place around 1280) and Scotland was France’s ally. As you can see, the fighting between England and France started long before what historians call that Hundred Years’ War, way back 271 years earlier. Here’s a quick video to help you understand the Norman Conquest a bit better. In the early 1300s, after 270+ years of on and off fighting, the poop really started to hit the French and English fans when, in 1338, Charles IV, the king of France died. You see, when royal people die, most countries would look to the “line of succession” to determine legally who is the next to take the throne. That doesn’t always work so well, because sometimes a king doesn’t have a son, then the rules of “who’s next” get all muddled (that’s why William the Conqueror invaded England 200 years earlier). At the time of the French king’s death (remember, that was Charles IV), he didn’t have a male heir to take his throne. His sister, Isabella, however, had a son named Edward. A few decades earlier, Isabella had been sent off to marry Edward II, King of England, to bring peace to the two countries for a while. By now, though, her son was King Edward III, King of England, and (she felt) the rightful heir to the throne of France, too. Isabella was her son’s biggest fan, even helping overthrow her husband (Edward II, who was Edward III’s dad) to get the English throne for her son (really, to make herself more powerful, too). The French did not agree – something about not being able to inherit the throne through a female relative, so Phillip VI became king of France. All was good for about nine years, but Phil kept sticking his nose in Ed’s Scotland business and the Hundred Years’ War began. The Hundred Years’ War, as we know, wasn’t just one big war – it was a series of wars that historians now lump together with a really cool name. Those historians, simply because they can’t agree with their own selves, also break those 100 years of war down into three phases (why that’s not three separate wars, I don’t know). The first phase of the war is known as the Edwardian Phase (because of King Edward III) and lasted from 1337-1360. After a few years of raiding and taking control of the northern regions of France, Edward was very successful, thanks, in part, to the supporters he’d bought on the mainland. The Battle of Sluys was the first big battle fought in the Edwardian Phase. It was a sea battle fought on June 24, 1340. The battle took place near the town of Sluis, in what is now south-western Netherlands. Most historians agree that the French navy outnumbered the English ships, but the battle went to the English, destroying almost the entire French navy and giving Edward III complete control of the English Channel. Afterward, though, Edward overtaxed his sailors and merchants, weakening his naval defenses. It wasn’t long before Phillip had the French navy rebuilt and regained control of the Channel. Because the world is awesome, the video below is a recreation of the Battle of Sluys done with legos. In August of 1346, another major battle in the Edwardian phase was fought. The battle was fought near Crécy in northern France. An army of English, Welsh, and allied troops from the Holy Roman Empire led by Edward III of England engaged and defeated a much larger army of French, Genoese, and Majorcan troops led by Philip VI of France. Having learned a great deal of new military tactics, strategy, and use of terrain from battles with the Saxons, the Vikings, and the Scots – along with new weapons (the longbow and the cannon) the English army was outnumbered, but far more experienced than the French. The English won a decisive victory. This one doesn’t have legos, but it shows the Battle of Crecy to help you better understand it. This battle was critical, because it allowed the English to take the city of Calais (the closest French city to the British Isles – a great strategic holding). The English held Calais for the next 200 years. Shortly after these decisive English victories, the Black Death began spreading across Europe and fighting ceased. Phillip died in 1350, giving his throne and control of France to his son John, who became known as John II. There was a treaty signed in 1360, and, for the most part, the war ended for the next nine years. 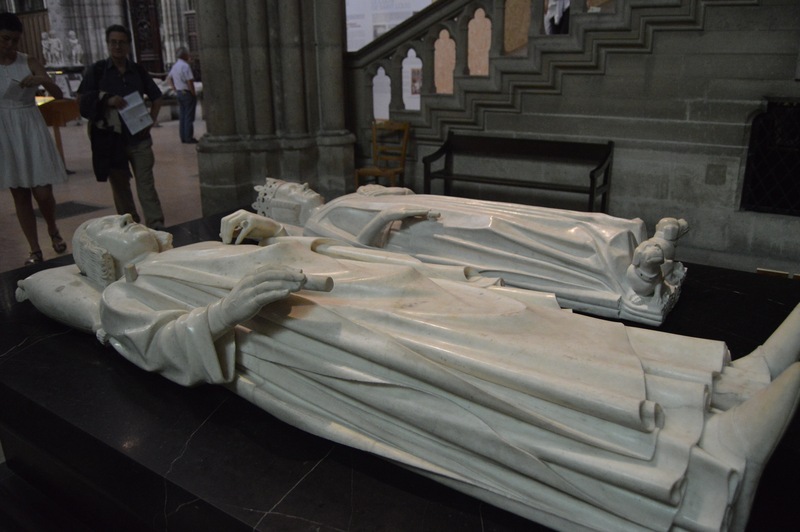 This is the final resting place of Charles V of France in the Basilica of St. Denis in Paris. Mr. Curtis took this picture during his visit there last week. During those nine years of peace, John II, the king of France, was captured by the English. His son, Charles V, took over his throne and attempted to ransom his father, but John II died while in captivity and Charles had the excuse he needed to return to war. This phase of the war, known as The Caroline War, was named after Charles V (nope, I don’t understand either), because Charles broke the treaty and restarted the war in 1369, taking advantage of Edward III’s old age and The Black Prince’s illness. Edward III was still in charge in England, but his son, Edward the Black Prince (who may have had one of the coolest names of the middle ages) was one of his military leaders and being groomed to take over the throne (unfortunately, Edward the Black Prince died before his father and became the only Prince of Wales not to become king). Anyway, in May 1369, the Black Prince got a message from Charles V demanding he come see him in Paris. It was kind of a rude message, and the Prince didn’t take too kindly to demands, so he refused. In return, Charles V declared war. Charles immediately began trying to regain the territory France had lost in the first phase of the war. Several battles took place, and France dominated, regaining almost everything they’d lost in the first phase. In 1376, the Black Prince died. His father reached out to make a peace treaty with Charles V, but Edward III also died before the truce could be reached. A ten year old boy, the Black Prince’s son, Richard II, was now the King of England. Just a few years later, in 1380, Charles V died too. His twelve year old son, Charles VI, was now king. 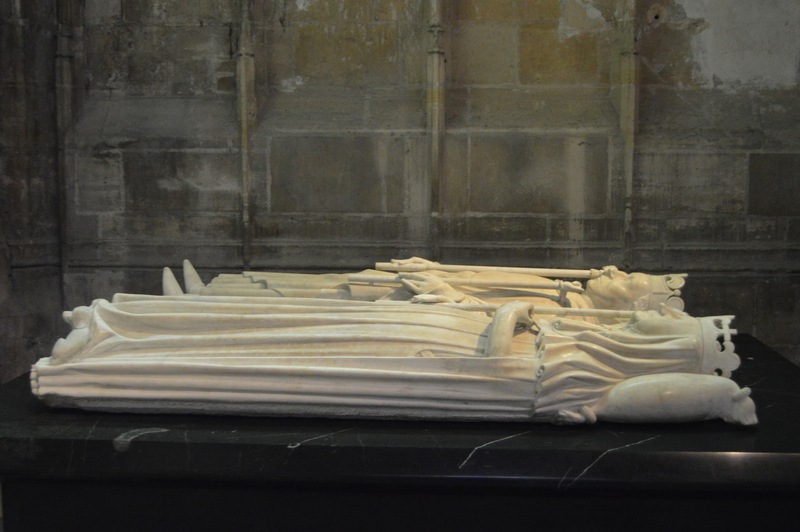 With two children on the thrones of England and France, and their advisors – both boys had their uncles really running the country – the war petered out over the next few years and ended in 1389. I got this picture of Charles VI’s grave last week in Paris. This one is also located in the Basilica of St. Denis. From 1389 to 1415, there was peace. A lot happened in those 26 years, but we’re not going to get into it except to say that it wasn’t just 26 years of nothing. By now, after a whole lot of upheaval in England, Henry V was now the king. Henry V really didn’t have any legitimate claim to the French throne, but that didn’t stop him from wanting it. Charles VI was still the king of France, and he was known as Charles the Beloved, but thanks to some questionable behavior in the next few years, he’d soon be known as Charles the Mad. Alright, here’s the simple version of phase three (called the Lancastrian War, because Henry V was from the English House of Lancaster). Henry invaded France and won some major victories very quickly – especially in the Battle of Agincourt, which was made famous in Shakespeare’s first play, Henry V.
This awesome video does a much better job than I could of explaining that battle. Just an interesting side note for you all – Mr. Curtis’ cousin is really into genealogy and had traced the Curtis family all the way back to a knight known as Richard the Courteous, fighting alongside Henry V at the Battle of Agincourt. 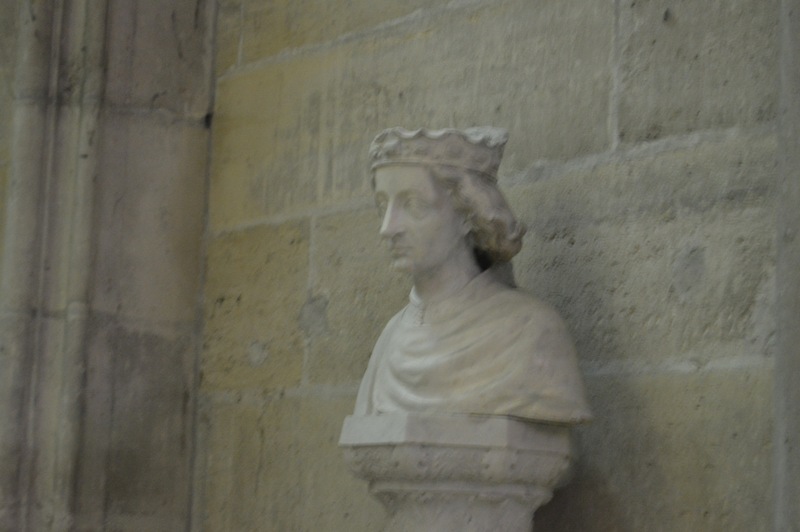 This bust is of Charles VII. Located in the Basilica of St. Denis in Paris, the bust is in the main part of the church, while Charles VII’s grave is directly beneath the marker in the crypts below the church. After the Battle of Agincourt, the French began to get scared. Eventually, John the Good, the Duke of a region of France known as Burgundy, made a treaty with Henry V. Henry would marry Charles VI’s daughter, Catherine of Valois, and Henry’s heirs would become next in line for the thrones of both England and France. This meant Charles VI’s son, another Charles, would lose his right to the French throne. This is where European history starts to get a bit crazy. Henry V died suddenly at the age of 35 in August of 1422, so his son, Henry VI became King of England. He was less than a year old. Over in France, Charles VI died a few months later, in October of 1422. His son, Charles VII, was (at least according to many of the French people) next in line to become King of France, but his grandson (the baby, Henry VI – remember, Charles VI’s daughter married Henry V or England) was also thought to be next in line for the French throne. The English were winning the war, big time. Charles VII was not recognized as the King of France, and the English had a major ally in the Burgundians (French people from a region known as Burgundy had sided with England). In 1428, everything changed. Enter Joan of Arc. 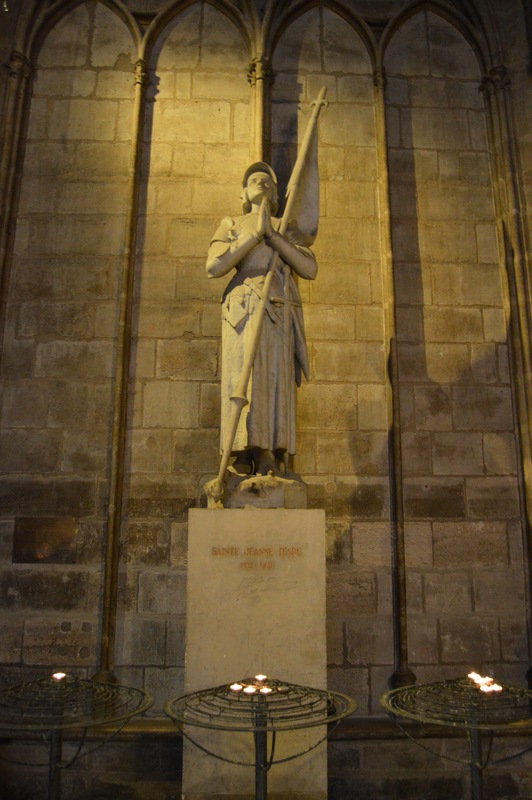 This statue of Joan of Arc is on display in the Notre Dame Cathedral in Paris, France. If you decide to visit the inside of the cathedral while we’re in Paris, you’ll surely see it. As with any Hollywood movie, the film your about to watch isn’t a 100% accurate version of Joan of Arc. Joan of Arc, Jeanne d’Arc as she is known in her native French, is thought to have been born in 1412 in the village of Domrèmy in northeastern France. Her family was a peasant family who valued Catholicism above all else. In fact, Joan was never taught to read or write, but was taught to have a deep love for her church and its teachings. At the young age of 12 or 13, Joan began hearing voices and seeing visions of saints and angels, particularly those of Saint Catherine, Saint Margaret, and Archangel Michael. Joan believed these visitors were sent by God to instill a mission of saving France and returning Charles of Valois (the guy who would be Charles VII) as the rightful king of France. In 1428, at the age of 16, Joan felt compelled to begin her journey and headed to the town of Vaucouleurs and appealed to the commander, Robert de Baudricourt, to allow her to see the royal French court. She was dismissed and treated as a joke. She returned a year later and this time, Baudricourt relented. Joan was escorted across enemy territory to Chinon and given an audience with the prince/king/Charles VII. During her 11 day journey Joan was given men’s clothing to wear and had her hair cropped. This was thought as no big deal and a measure to keep her safe during travels, however, this dressing in mens clothing was what eventually led to her conviction and subsequent death. Upon meeting Charles, she promised to see him crowned king and requested an army of men. Perhaps at a loss for hope, Charles granted her request, but not before proving she was not a heretic or sorceress. He did not want his enemies to claim his crown was a gift from the devil. Joan was proven to be a Christian of the utmost virtue, and set off for the city of Orlèans which was under siege by England. Joan led several assaults against the Burgundians (a French faction working on the side of England) forcing them to retreat. Joan’s reputation for success spread across France and in 1429 she was able to lead Charles to Reim, forcing resisting towns to relent, and enabling Charles to be crowned King of France. After this victory, Joan wanted Charles VII to give permission to try to take Paris back from the Burgundians. They were unsuccessful and Joan and her men had to turn back. In 1430 Charles ordered Joan to oppose a Burgundian attack on Compiègne. Here Joan was thrown from her horse and left to be captured by the Burgundian forces. In a great amount of display, Joan was brought to the castle Bouvreuil in Rouen. Joan was put to trial on 70 counts including heresy, witchcraft, and cross-dressing. In 1431 after being held for roughly a year, Joan signed a confession under duress. Not too long after that, she was caught dressing as a man again (to protect herself from being assaulted by male prisoners in the castle she was held in), was convicted and sentenced to death. At the age of only 19, on May 30th, Joan was burned at the stake in the market place in the city of Rouen. Twenty years after Joan’s death, Charles VII had her retried and her conviction was overturned. It wasn’t until 1920 that Pope Benedict XV canonized Joan and she became Saint Joan of Arc, the patron saint of France. It’s worthwhile to take a closer look at Joan’s most famous victory, the Siege of Orleans. This video, as well as the movie itself, will give you a good idea what it was all about. Here’s a fun TV show called Deadliest Warrior. This show takes a look at warriors from history, their weaponry, their techniques, and their technology and uses research and computer modeling to see who would win the fight. This episode pits two French leaders against one another – Joan of Arc, the French saint from the 1420s versus William the Conqueror, the Norman general, and later English King, who invaded England in 1066. Finally, because this is the world we live in, and everyone needs a little bit of silly fun in their lives – here’s Joan of Arc vs. Miley Cyrus: Epic Rap Battles of History. Don’t watch if you’re offended by a few naughty words. As you’ll see in the movie, Rouen is the city where Joan of Arc was put to death. On our trip, we’ll be visiting Rouen. The city is located on the River Seine in the north of France, has a long history dating back to the ancient Romans. Its location near the Seine led to its development and made Rouen one of the greatest cities in France. It is the capital of the region Normandy and was one of the largest and most prosperous cities in Medieval Europe. Rouen is most known for being the site of Joan of Arc’s execution in 1431. Rouen is thought to have been founded by the Romans in 3rd century CE and was known to the Romans as Rotomagus. In 841 the Vikings overran Rouen and it became the Norman capital. In 1066 Rouen became the subject to the English crown, but was captured by France in 1204. Then in 1419, Henry the V took Rouen back during the Hundred Years War. Finally in 1449 it was recaptured by Charles VII for France. Rouen remained prosperous until the Wars of Religion when more than half the people left the city. However, in the 19th century the textile trade brought new prosperity to Rouen. Rouen is a city rich in history and culture, along the right bank of the Seine and surrounded by hills. There are many historic buildings and museums from a wide variety of architectural styles. Probably the most well-known building is the Rouen Cathedral, one of the finest gothic churches in all of France. During WWII Rouen was damaged by allied bombs, and the cathedral narrowly missed total destruction. Another amazing site in Rouen is the beautiful gold faceted Gros Horloge, or great clock, a working street clock. It is a symbol of the past wealth of Rouen from the wool industry. Tourists can travel to the top for a panoramic view of the city. Other places to visit include the Palais de Justice the gothic law courts of Rouen which were destroyed during WWII and later restored to their original beauty. Visitors can sit in on a court session. While at the Palais de Justice, visitors can also go to Monument Juif, which is the only relic from a medieval Jewish community and is hidden under a staircase at Palais de Justice. There is also the Artre St. Maclou which is a village that is home to half-timbered buildings built between 1526 and 1533. These buildings, many of which were homes, are decorated with woodcarvings of skulls, crossbones and hour glasses. At one time it was where they housed victims of the plague. The modern Church of Joan of Arc, built on the site where the saint was burned at the stake. Travelers are of course drawn to the Place du Vieux Marche, which is the site of Joan of Arc’s execution. A cross lays at the exact spot where she was burned at the stake in 1431. In 1979 Èglise Jeanne d’Arc, a modern church known as the Church of Joan of Arc, was built at this site, in remembrance of the Patron Saint of France. It is known for its fish scale exterior as well as ornate stained glass. The glass came from the Church of St. Vincent which was destroyed during World War II. However the windows were removed and stored during the war and remained intact, which adds an element of the past to the modern. So, sit back, relax, grab some escargot and a few crepes, and watch our Movie of the Month, Joan of Arc starring Ingrid Bergman, along with the other videos we’ve posted today. You can find the movie free on YouTube, so no need to spend any money or rent anything this month. We’ve embedded the entire movie below, but you can also find a few other Joan of Arc movies online if you’re interested. The Passion of Joan of Arc, is a French movie from 1928 that takes its script directly from Joan’s trial – it’s well worth watching a little bit of if you have the time. We ask that all of our France/Benelux travelers take the time to watch our Movies of the Month, then come back here to discuss the movie, the history, and the impact this story had on the people and places we’ll visit. In your response, we’d like you to tell us first what you thought of the movie and why. Second, tell us three specific things you learned from watching this movie (and reading this post) that you think will make your experience in France and the Benelux countries even better than it would have been. Please remember, there is more to this post than watching a movie – you should be reading the post and viewing the other videos to learn about history too – your answers should discuss both the history and the culture you learned about in this post. The longer and more in depth our discussion gets, the better it is for all of us. I didn’t like Joan of Arc that much, but it was ok. It was kind of boring and I was lost at some parts, like the trials. Overall, though, it was a decent movie. I learned to stay true to your strong beliefs. I learned this from Joan, who would’ve rather been burned at stake then live unfaithful to God. This will make my experience better because I won’t let one person’s opinion change mine. Another thing I learned was beware who you trust but don’t be mean about it. I take the beware who you trust from the French king who signed the peace treaty, even when Joan told him it was a bad idea. I take don’t be mean about it from my own experiences. This will better my experience because it will help me interact with foreign people. The third thing I learned was sometimes the people who impact your lives are the least expected people. I learned this from the executioner who gave Joan the cross before she was burned. This will make my experience better because I will give everyone a chance before jumping to a conclusion that they’re rude or mean. What did you learn from the other videos and the post itself? In my eyes, Joan of Arc was a bore. I generally found myself spacing off for a second or two. There were some parts I was interested in, and the ending nearly made me cry, but overall, I can’t say that I liked it all that much. I learned that with determination, and the desire, you can do anything at any time at any place. This is shown by Joan in the beginning as she continuously tried to join the army. Eventually, she got her wish, with spirit, determination, and desire. Another thing I learned is that if you stay true to what you believe in, you will die a happy death, even if it is early. An obvious example is when Joan is being burned in the end, yet she shows no sign of sadness or pain, because she was staying true to Jesus and God. A third thing that I learned is an impact in your life can be made by any person, even the ones you least expect. This is shown at the end when the executioner gives Joan a cross to hold while she is being burned to death. I learned that the 100 years war was periods of switching peace and war that actually went on for over a century. The 100 years war is broken up into 3 phases and Joan fights only in the last phase. I better understand the time frame and the advanced technology of that certain period. Also, I learned more about what happened previously and how that contributed to the situation. I have a better understanding of how Joan of Arc impacted France. She put and end to the 100 years war and made England back out of France. It will be interesting to go to Rouen and see where Joan was burned. It looked like she was burned in a city center, I bet there is a plaque or statue in the place where she was burned. I would also like to see this place too, to visit the place wood be creepy but cool all at once. I think I would appreciate visiting this place more because I better understand Joan of Arch from the movie. In my opinion it was boring and confusing especially the part where she says she doesn’t want to leave through the city but she does anyway. They don’t explain why she did this or how she changed her mind. It would have made more sense if they had added detail to it. I know this is Hollywood’s version of the story but they didn’t do a very good job of staying consistent. I did know a little about Joan of Arc before I saw this so it didn’t help a lot with explaining who she was. I knew she was very religious and because of her strong belief in God that is why she thought she had visions and was to help lead her country out of war. The second thing was that she dressed like a man. It didn’t seem to go into detail about why but I know from the history that it was for her safety but in the end became one of the reasons she was burned at the stake. The third thing is that she was captured and put on trial and found to be guilty of witchcraft and false religious beliefs against the catholic church and burned at the stake. Even though she died it shows how strong her feelings were about her country and that she was willing to die even at such a young age (19) for those beliefs. I think in the end the other videos that were posted along with the movie information were more interesting about the different wars that were going on before and after her time. It is always a little confusing with all the different monarchs and who ruled what when but it is important to history and the reasons for many of the wars. I did notice the clothing they used in the movie was a lot different from what we wear today. The royal people, whether they were men or women looked like they were in dresses. I am sure that is in part the type of clothes they were in the time period. The other information in the post I found to be interesting was that we will be visiting the city where she was killed and that there is now a church built on the site. I look forward to visiting it on the trip to learn more about her and seeing the area for myself. Joan Of Arc was a good movie, but not the best I’ve seen. I thought the settings were very poor and the movie was only 1 hour long. Yet some parts very good. I learned a lot of things from this movie that could help me with the trip and life outside of TAP. Don’t trust everyone you see. People in the movie like the king. He seemed like a good king, but didn’t listen to what Joan had to say. Another Thing I learned was to never give up on anything and always know that people around you will always support you. Like in this movie Joan looked for her friends, but she mostly looked for God more. I respected this because believe in him or not, most people talk to God to help with problems and just to let out what their feeling. Another thing is a quote “keep your friends close, but your enemies closer” I say this because before she died the person who was going to kill her gave her a cross, because he knew she looked to God for guidance. Overall I thought the movie was ok. Could of been longer but some of the movie was good. I ask also learned to always look to your people around you for guidance and help. I kinda enjoyed the movie. Yes some of the parts were boring. I learned that Joan has strong beliefs in God. I also learned to have a lot of trust in people you have known for a long time. I also learned that people who impact the world are the least expected. From the post I learned that shes good at rapping :). But that in Europe in Notre Dame she in church’s and some of the architecture of some of the cathedrals. The rap video was entertaining… Did you see in the beginning of the movie the Church bells? The landscape was pretty cool, some of the church scenes were amazing. I hope we get to see one of the castles. In my opinion I didn’t like the movie at all. I thought it was really boring and most of it didn’t really grab my attention but I think that’s just because it’s not directed the way movies are today and I’m just not used to it. I did learn a few things but most of the time while I was watching the movie I was really confused as to what was going on since I didn’t understand some of the words/phrases that they were using in the movie. Before I watched the movie I read the things you said about the movie and I watched the other videos and some of those videos (such as the Lego video) were entertaining and actually helped me understand what was going on in the movie a little bit more. There was a really important thing I did learn from the movie though and that was whatever you believe in, weather it just be a simple little thing such as what clothes you like or something big such as a religion or political veiws that you always need to stick with that and don’t let normality or other outside opinions change your views. While I’m in Paris if I see something that I’m interested in that most other people aren’t really interested in I’m not going to pretend I don’t like that thing because other people don’t. The second thing I learned was about acceptance. Joan cut her hair to make it look like she was a boy so she could go and fight what she thought was right. She had to be accepted into the group of soldiers and frankly she didn’t seem to care. She would go to all measures just to be able to do what she felt was right. That shows major dedication. The final thing I learned was Joan was only 18-19 years old and she led France to a victory. I think that’s pretty amazing that at that age she could do that. There must of been some doubts about her since she was a girl and she was so young to do something so amazing. Often society labels too quick, you look different then other people your considered weird. You act different from other people your strange. I’m sure even though that time was a while ago people still thought weird about her or talked bad about her but she didn’t let that stop her. She kept going no matter what anybody said about her. She is such a strong person to be able to do that and she is so inspiring for that. That may not help me for my trip to France but that will help me in everyday life and I think that’s the greatest lesson you could learn from the movie. I’m sorry to say that Joan of Arc was one of my least favorite movies of all time. Even though I didn’t like the movie all that much, there were some parts that I found interest in. I enjoyed watching the battle and how interesting their battle techniques were and differ from current times. I thought it was ignorant for them climb up ladders to try and capture their enemies. They became easy targets that way. I admired Joan and how she followed her beliefs even in the most critical of times. She followed her beliefs so much that she was willing to die at such a young age for them. I’m also intrigued by her boldness. People don’t just go to kings or those in high authority and say that God sent them with a message. That took real courage on her part. I’m excited to visit Rouen and will have a much greater appreciation for the history that took place there after reading this post and watching this movie. 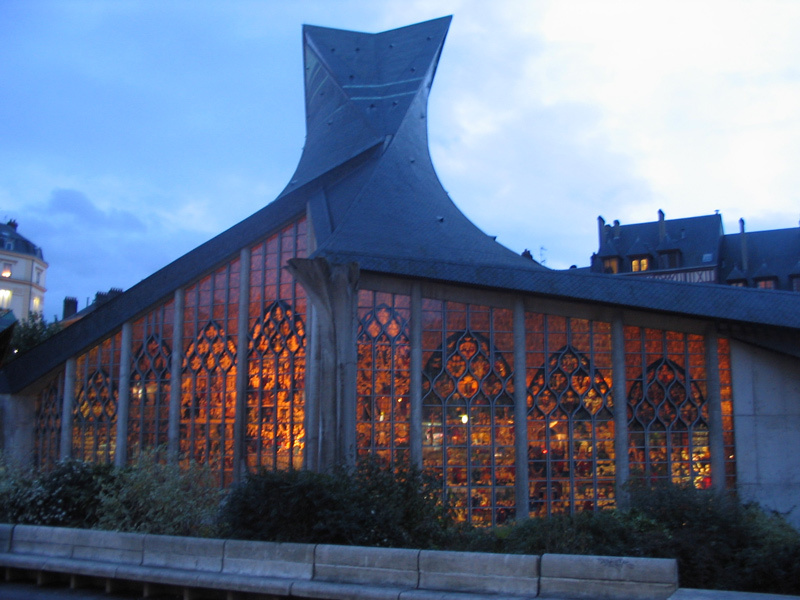 The modern church of Joan of Arc is very awesome looking in the picture and I can’t wait to actually see it in person. It think it is a real shame that Charles VII didn’t try to do anything to save her while she was on trial. Instead he waited 20 years after her death before he had her conviction overturned. She did so much for him and received nothing in return from him. It seems he could have done something to save her if he wasn’t selfish and all about himself being king. this movie was incredibly amazing. jessica and i couldn’t find a way to watch the version of the movie you suggested, but after watching the movie and reading the post, i have a good idea of the history. first of all, this movie had a female woman of power which was amazing. back in the 1400s when joan was around, women were nothing compared to men. however, although it may be of great inspiration to us now, her gender was a big factor into why she was convicted. it may just be because we watched a more hollywood version of the movie, but the movie said that the maid of lorraine was a prophecy by merlin. is that true? you didn’t say anything about that in the article so i wasn’t sure. this war happened during the most unfortunate time, didn’t it? the black death is still one of the worst things that has ever happened to europe and it happened during a war. not only did the population suffer from the casualties of war, but it also dropped significantly from the plague. it’s also weird to think because joan’s family could have easily died from the illness. what if joan’s father or mother had died from the illness? all in all, this movie was very good and the history surrounding it is incredible and a bit humorous at times (a 10 and 12 year old ruling the country… yikes. imagine 5th and 6th me ruling countries…). i’m so excited to see the places where joan was!! the church that was built in her honor sounds so cool. it’s really cool that the glass is from ww2. it’s like a mixture of “two” wars!! that I would love it since I like old movies. Even considering how old it is it was still interesting and action packed and was just as good as the movies from recent years. I also learned a lot from this movie. One of the most important things that will make my trip even better is that, If Joan hadn’t went to Charles de Ponthieu to tell him about her visions and that she needed to lead the army, England could have taken rule of France and it wouldn’t even exist. And that means we wouldn’t be going on this trip. I also learned that you should never give up in what you believe in. Because sometimes, like in Joan of arcs case it could end For my tap project for august, we had to do a report on the movie “Joan of arc” it sounded okay, But the when I saw that it was from 1948 I knew up saving France. Lastly I learned how much history is packed into the 100 years’ war. It was so influential and changed the outcome of how we live today and without it the world would be a totally different place. In my opinion i did not really enjoy Joan of Arc that much. To me it was hard to understand and was a little boring and slow. Although the movie wasn’t the best it was quite educational and I learned a lot from watching it. I learned to stick with your opinion even if someone tries to say its wrong, I also learned that you can’t just trust a person based on how they look and how they present them self because you never know who they might turn out to be. At first the king seemed nice but never listened to what Joan believed and what she thought. The last thing I learned was you never know who can change the world and the least expected can do the greatest things. Overall this movie was very educational even though it was hard to understand right away. I don’t think that during France I will be using any of these things I have learned from this movie but I will for sure use them in the future. I personally thought the movie was okay. The movie wasn’t too bad, but it seemed like everything was dragged on for too long. One thing I learned was from that Joan was killed in Rouen, which is a place we are going to. This will make my experience better because when we are in Rouen, I will remember the historical events that happened there. Another thing I learned was that back then you did everything for your country, which not everyone does today. By knowing this, as we are touring I can look back at this movie and remember the history and lifestyle of the time. Lastly, I learned that Joan was very religious. She was so religious she was willing to do whatever for the Lord. By knowing this, I can think more deeply about the historical events when touring. In conclusion, the movie was okay but I learned a lot from the post and movie. I thought that the movie was interesting and had a lot going on in the movie. I had to watch the movie two times to make sure I understand what was going on and the lesson that Joan was trying to tell us. Joan is a girl that I think likes to be in charge, a country girl that believes in people. She believed in France and is willing to fight for the people that are being attached or injured. I learned that you should believe in your beliefs even tho someone else has a different opinion then you. Like a king, he can make the right decision but he can also make the wrong one to. You have to believe in your country and stay with them and fight. When she cutted her hair that is when you know she is committed to her country. The movie was not my favorite, I found it boring and it did not hold my interest. Although it was slow I did enjoy the scenery, the castles and the church were beautiful. They also showed some of the landscape along with some of the villages that looked pretty rustic and cool. The history of Joan of Arch was so sad, she was so strong with her beliefs and faith in the church and with God. War is never a good thing because everyone looses and has to suffer the consequences. I think this could improve my trip to France because it helps me better understand the history and past culture of France. The Joan of Arc left me a little disappointed re-guarding the events. It was hard to follow and I became very lost on a few of them. One thing that really grabbed my attention was Joan’s perseverance for her country and the way she carried herself through out the whole movie. Most people after one or two times of being to no will stop trying for something they want. Joan wanted to follow her religion and her show God her love so she did not quit no matter how many time she was shot down. Even though she ended up dying, she ended up dying for the love of God and for following what she loved. All she wanted to do was fight for peace for her country and she was able to do that with her commands because she pushed her way through the hard things and got what she wanted. This movie shows many different types of good and bad power. Joan got her ideas from a good place and her ideas were genuine, but the king made decisions based on what certain people wanted but those people were selfish. The lesson I got out of this movie was to follow what you believe in and do what you think is right. Joan of Arc was a great movie in my opinion, but it’s not like my absolute favorite. I learned that in the past, the French and English did not get along very well. The English were trying to gain control over France and their King. In the French’s response, they obviously tried to protect their King and land from the English, and did everything they could to do so. Then, the war between the two erupted and kept going for years until the French people became United and freed, with the Burgandish siding with them after seven years of Joan’s Death and helped drove English out. I also learned that the king resigned for 30 years. In the movie, I see that after one of Joan’s loved ones died in the fire, she gets really angry and yells at God for taking him. God then shines a light onto her and chooses her to be the one to free the French and give King Charles his reign back. Joan tries to go out to free the French that were captured by English, and to crown Kimg Charles, even if it meant risking her own life. What really made me mad was when the men (I forgot what they were called) didn’t believe that she could complete those two tasks that God had asked her to do. They thought that just because she was a girl, she couldn’t handle dealing with the violence, fires, weapons, and the fights overall heading her way. Seriously, if she wants to help out and believes she can do it, let her do it! The stereotype stating that girls can’t do anything tough just makes me really mad because that is not true at all. So she still goes out there, since she believes in herself. She comes across some conflicts with her and the English Bishop. She asks him to free the Feench people he captured, and mentioned something about God wanting him to do that. The bishop says, “WHY MUST YOU BELIEVE IN GOD AND WHY MUST YOU ALWAYS TALK ABOUT HIM!” Joan then says, “BECAUSE I STAND UP FOR WHAT I BELIEVE IN!” I’m not completely sure that dialog was word for word, but their argument was along that line. The Bishop still didn’t like that, so he sent some of his men to tie her on a stake that was on fire to burn her. She unfortunately passed away, but she died for her country and for King Charles. That really made me smile at the end! Aside from the war between the French and the English, I think there were multiple messages in this movie. The first one it was trying to convey was that we should never let anyone stop us from achieving our dreams or completing a task we want to complete. If you truly want something to happen, you do everything you can to make it happen. The other message was that you should stand up for what you believe in! This message would help out a lot of us today. If there is something or someone you truly believe in, stand up for it! For if you don’t stand up for what you call your “beliefs”, you probably don’t truly believe in it. I didn’t like the movie very much, it wasn’t very exciting to watch except for the fighting parts, but there were some things that interested me like how god spoke to Joan and told her to lead France in the war. Also when nobody believed Joan she would have god speak to them too. But there were some people who didn’t like Joan and arrested her towards the end of the movie, but Joan kept praying trying o get out. Also Joan has taught me to stick for what I believe in and to not let anybody say no to these beliefs, and because of Joan’s beliefs she died, but she died trying. So even though I thought the movie was boring and I didn’t like it it still taught me something, and that thing could do a lot. I love old movies like this and my mom was excited when she heard Joan was played by Ingrid Bergman. It was a bit boring at times and to be honest I had to take a break to nap. Overall the movie wasn’t too bad though nothing I would want to watch again though. It gave me a good idea of what Joan struggled through and it is very hard to believe that this actually happened in a way. I learned that Joan of Arc was more a figure head of the French army than an actual warrior fighting. It is very hard for me to understand Joan because honestly most of the movie she seems like a complete crazy person. Of course that’s just probably because I’m an atheist and cannot relate to her on a religious level. I did learn that a ton of people did have great faith in her and prayed for and loved Joan. Her dedication is admirable and it is kind of insane that she’d rather burn at the stake than give up. I recently learned burning is the worst way to die and you feel your skin melt off then your muscles and so on, so props to her. I’d have been outta’ there before you can say, “Praise the lord”. Honestly I think Joan was blinded by faith to the point where she was acting illogical and it was her downfall. On the other hand she can do whatever she wants with her life and if that is getting herself into crazy situations because she feels god told her to then so be it. I don’t mean to sound like I’m knocking her but what one looks at as extremely brave another could see as extremely foolish. She really didn’t deserve that fate, she was doing what she though was right for her country. The last thing I learned was a lot about 100 year war which I perviously didn’t really know a thing about. Honestly I didn’t even know the 100 year war was multiple wars categorized as one. Any ways I look forward to the next movie of the month because this one wasn’t all that bad. It was actually pretty enjoyable. Overall, I thought the movie was okay. I liked it because it has some very exciting and very unexpecting parts like the war. I didn’t like the movie because it has a lot of not as exciting details a lot in the story conflicts. One thing I learned from the movie is that back then religion was extremely important. This is because they took their religion very seriously and followed rules their religion had . Joan was captured and tried unfairly for witchery because she had help God and they thought that she was using magic against them to win battles. They thought this because she was able to show her religious beliefs in a way they haven’t seen before and since it was strange they wanted to get rid of it. Even though she was tried and knew she was going to die she stayed true to her beliefs which is the best thing anyone could have ever done. On a different note is is good to stay true to your beliefs but not to make other seem like they are wrong because they are saying things based on their beliefs . Another thing that I learned is that trust is usually earned and if you break that trust it is very hard to get it back. Also someone who doesn’t trust anyone has a hard time trying to trust others. For example the king doubted Joan and didn’t think that she could ever take back territory like this. After she proved him wrong and made him king she trusted her. Then when she asked for him to go with her into to battle like he promised he said no leaving her to go alone and be captured by the enemy. THis shows that having trust in someone is extremely important and if you don’t trust anyone you might have problems in the future. I also learned that having people that you can trust is also very important like how Joan could trust the leaders/ generals that she fought with. If you have someone you can trust it really makes your life easier and helps you a lot more than you think. I personally thought that Joan of Arc was an okay movie. To be there was a lot of information coming that I got lost at a few parts, bu there were a few parts that made me want to keep watching. I am actually a history nerd on some levels, so I knew basic information before reading the information above and watching the movie. Joan of Arc was a peasant girl living in medieval France at the time of the 100 years war. Although she had no military training she believed that God chose her to lead the war for France. This movie showed following your beliefs can lead you to power, but can also be your downfall. When Joan was leading the war she was only 18 or 19, and that is huge inpiration for anyone. Near the end of the war Joan was burned at the stake, even after leading Frace from victory. Although this movie wasn’t great it was very interesting, I was able to learn a lot of information about France during this period. Before I talk about the movie, I want to talk about the post as a whole. Personally, I love history, so of course I read the whole article before hitting the play button. I’ve even watched the videos, Deadliest Warrior being my ultimate favorite, which did help me understand more of the history and logistics of the 100 years war and Joan as this young woman, leading the French army to war with her strong faith. Knowing some history about the country we’re about to go too is definitely beneficial before going on this trip. Joan of arc was this simple country girl who ended up saving France and defeating the British during the 100 years war. Yet she was betrayed by her country and burned at the stake being accused of witchcraft. Even though this story has quite a bad end for Joan, it doesn’t make it any less memorable. Joan of Arc’s tale is truly one to remember. Her story displayed in this movie was quite interesting, you can imagine the actor was actually ‘the’ Joan of Arc as she played her role. Even though the pace of the film was slow, that didn’t change what the movie wanted to portray. It wanted to portray the story of this heroic young girl who saved France, which we got. Of course every movie has it’s ups and downs. One thing that I wish I would have seen from this film is the epilogue after Joan’s death. What her actions did for France and what benefitted from her sacrifice. One thing that I learned from this film is that the country of France wouldn’t be what it is today without it’s events in history. I’ve come to realize that history is very important to each country and that we should take some time to learn bits and pieces. Secondly, I learned that we all have the potential to do something amazing if we really set our minds to it. All hard work pays off. Some people may not see that at first but it’s true we all have that secret potential, even if we aren’t called by god. Lastly, what I’ve learned that will benefit me the most on this trip, is that every country has it’s own beliefs, rules, and it’s own history that will be remembered throughout the generations. I honestly found it pretty great to watch a re-enactment of a historical person. It will remind me to never forget them, never forget my own history, and never forget what they have done to make what is now happen. Joan of Arc wasn’t a very good movie in my opinion. The scenes were not very detailed and the acting was poor. I felt that the story was jumping around a lot and was lacking detail. However, I did learn a few things from it. Joan of Arc was very religious. She believed that whatever God wanted her to do, she had to do it which is why she had so much faith in her French army to beat the English. I also learned that at the time Joan of Arc was alive, that the people believed in sorcery. This surprised me because people in the present time would think you are crazy that you believe someone is a witch. In the movie, after Joan said that the army would lose the battle that took place that day, the priest of the village came to where she was staying to see if she was a witch or a child of God because she predicted the outcome of that battle. They believed that she used magic to predict that outcome even though she said God told those her things. In the end, the priest confirmed that she is not a witch.Lastly, I learned from the movie and the post is that Joan of arc was convicted and burned on a post as a death penalty. These events that I learned from the movie and the post will help me better understand the history of France and many of their forever lasting leaders in their country. I think your right i liked the movie. But i thought that it jumped around a lot too. I thought the movie was ok. It was slow at most parts with nothing going on. To me, it wasn’t the best. One thing I learned is that France and England was in a time of constant wars with some small years of peace. Knowing this makes me know more about the history rather than just going there. Secondly, I learned to stick with what I want to until it is accomplished. Joan wanted to go in the war and lead to victory. A lot of people doubted her and laughed. But she went with it and continued to do it and eventually won the war.